Tantalumize free WordPress theme is an awesome portfolio template where you can easily showcase your high quality featured works and services to potential clients. The crisp custom typography and creative layout of Tantalumize free theme immediately add personality to the overall look and feel of the site. It also comes with clean and well-structured code so that it will be easy to customize the theme to your special needs. A .pot file allows you to conveniently translate the theme into your preferred languages. 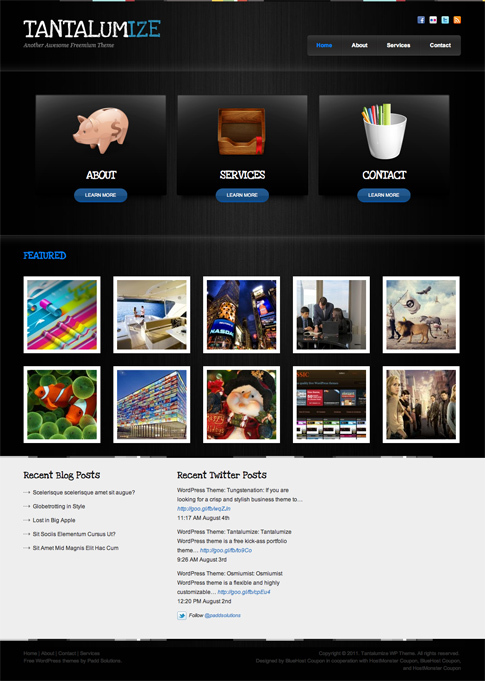 Check out Tantalumize free WordPress theme at the end of the post today! Come back and check out the showcase as we find more sites from around the web using Tantalumize.